Pining for the fjords? 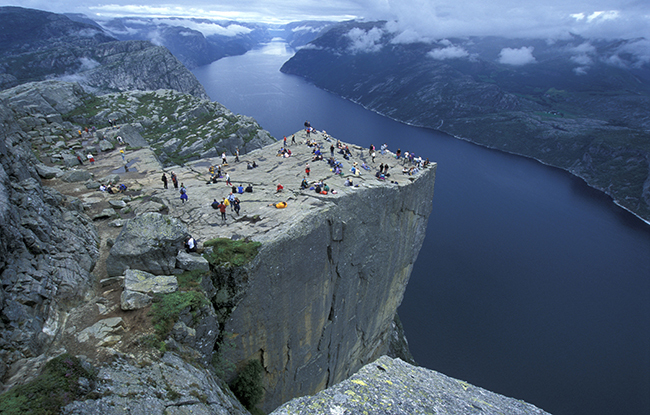 Tom Cruise dangles from Preikestolen in his new film—but they aren’t calling it Norway. The new Mission Impossible movie will include scenes filmed at Preikestolen—but the iconic Norwegian landmark will be located in India in the film. Despite the film’s relocation of the spectacular cliff face, which attracts hundreds of tourists annually, the scene remains a good advertisement for Norway, tourist industry representatives said. Cruise filmed his scenes at Preikestolen (Pulpit Rock) in November last year. The dramatic scene, in which Cruise hangs from the edge of the famous attraction, was seen as a huge win for Norway’s tourism industry—so many are likely to be disappointed that the film itself sets the action in India. The story was first reported by media Minerva. Elisabeth Saupstad, director of Visit Norway in Stavanger, told Dagbladet that cinemagoers would quickly work out where the scene was actually filmed. “Preikestolen is almost as iconic as the Eiffel Tower in Paris, so I don’t think it will be a problem,” Saupstad said. Hege Kjellevold, manager with Stiftelsen Preikestolen also said it was not a problem that the scene was set in India. “We were prepared for this. That’s how it goes in international blockbuster movies. It is unlikely that a story like that would be set here,” Kjellevold told Dagbladet. The American film production received NOK 6 million (about $730,000) from the Norwegian Film Institute’s investment arm, Dagbladet writes. The goal of the investment fund is to promote Norwegian culture, history, and nature.